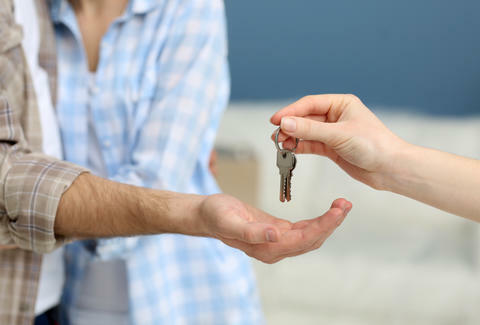 No matter where you live, you're probably wishing you paid less rent. In fact, if over a third of your income is going to housing, you're officially categorized as "rent burdened" according to federal standards. Spoiler: A whole lot of the country is rent burdened. To get a better idea of what this situation looks like, and how it affects you, check out this report from the National Low Income Housing Coalition. The study looks at the (highly concerning) gap between wages and housing costs in the United States, and one of the most compelling parts of it is distilled in a map (shown below). It tells you how much you'll need to make hourly to afford a 2-bedroom house in your state. Specifically, the numbers show the hourly wage required to spend under a third of your income to pay Fair Market Rent -- that's what HUD calls the 40th percentile of rents in the area. Depending on whether you live in Hawaii or Arkansas, this could be good news or bad news. But no matter where you live or what you're paying, we're sure you could stand to be paying less. When you consider that federal minimum wage is just $7.25/hour, and you compare that to the numbers on this map, you'll start to see the NLIHC's point. 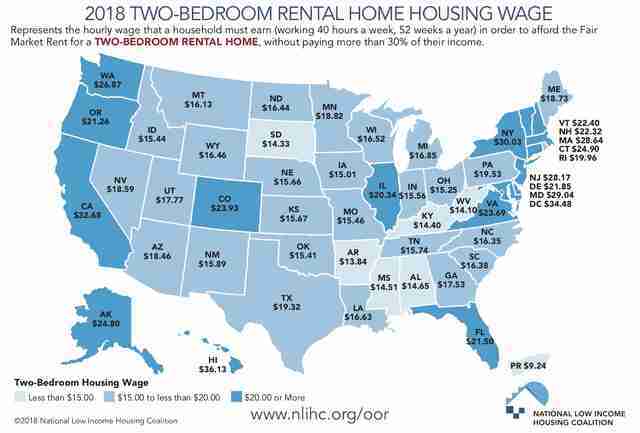 First, no one making minimum wage can afford a two-bedroom in any of these states without being rent burdened. Second, you'd need to make around double minimum wage to afford rent in the cheapest state on the list, West Virginia at $14.10 an hour -- around $29,300 per year. Compare that to the most expensive market, Hawaii, where you'd need to make $36.13 an hour, almost five times the federal minimum wage. Check out the NLIHC's full study and interactive map for a broader overview and state-by-state breakdowns.